You probably aren’t aware of it, but you get an oral cancer screening at every checkup. These screenings are quick, easy and non-invasive. 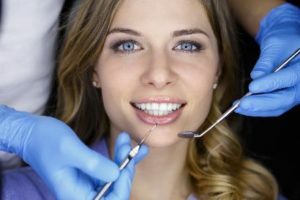 In fact, both your hygienist and dentist spend time visually inspecting all the soft tissues in your mouth for any suspicious lumps, bumps or lesions. Sadly, oral cancer has been on the rise in recent years, especially in younger people who don’t have a history of tobacco use. As with all cancers, early detection is key for good treatment outcomes. Your gums are the foundation of your smile because they support your teeth and keep them in place. That’s why advanced gum disease is one of the leading causes of tooth loss. You can even lose teeth that have never had cavities if they don’t have healthy gums and bone to support them. Seeing a dentist every six months is the best way to catch gum disease early and prevent it from progressing. When a dentist is regularly monitoring your oral health, they can catch potential problems before they turn into bigger problems. It’s much easier to schedule any necessary dental work on your terms rather than deal with an emergency toothache on vacation, in the middle of the night, or during a busy work week. Cavities are much easier and less expensive to treat when they’re small. At this stage, the chances are good that you won’t even feel them, but they can be detected with routine X-rays and dental exams. If cavities go untreated, they’ll eventually need more extensive procedures than simple fillings, such as crowns and root canals. Although there are certainly serious consequences to missing routine checkups, there are some good aesthetic reasons to go as well! Professional cleanings with a dentist in Wetherfield remove the unsightly, cement-like deposits of tartar that you can’t remove at home. You also get your teeth professionally polished, which removes stains and keeps your smile shining bright. When it comes to your oral health, prevention is the name of the game – and 6 month checkups are a crucial part of that! Dr. Brendan Dolan prides himself on building long-term relationships with his patients that are based on trust. He always encourages his patients to come in regularly for routine checkups so he can keep a close eye on every aspect of their oral health. If you have any questions, he can be reached via his website or at (860) 529-2000.